Nothing is as important for the reliability and durability of an awning as fully developed, qualitatively perfect mechanics. 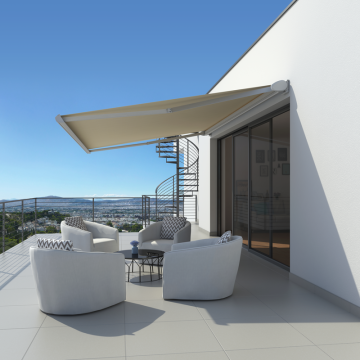 Therefore, all pivot arm awnings are made of high-quality and corrosion-resistant materials and coatings. Depending on the product, we give you up to 7 years' guarantee! As with all awnings, here too, an enormous selection of frame and fabric colours is available for you to freely choose and combine. Make these awnings your awnings!